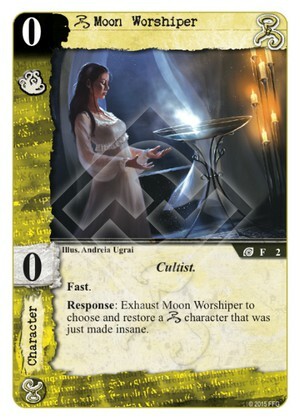 Response: Exhaust Moon Worshiper to choose and restore a [Hastur] character that was just made insane. Hastur get its first zero-cost characters with this box. She restores your Lunatics or Ben Herriot for free and can defend stories against a char without terror/wp in early game. If only she had 1 skill... 3/5.